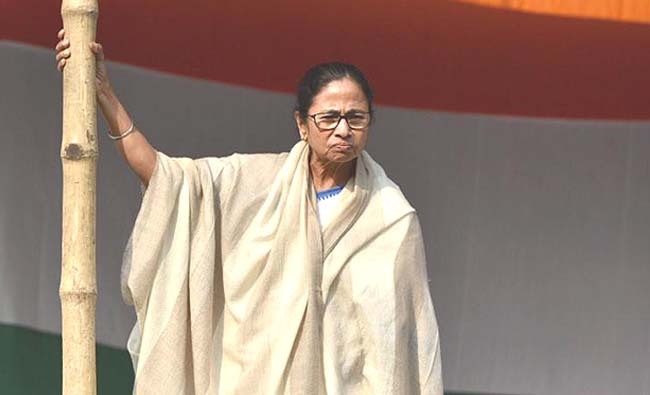 Kolkata/New Delhi, Feb 5:The unprecedented stand-off between the Narendra Modi government and the Mamata Banerjee government in West Bengal stretched to the second day on Monday as the feisty Chief Minister continued her sit-in, emboldened by the support from opposition parties from various states, some of them even joining her on the dais. With the centre-state showdown showing no signs of abating, Governor Keshari Nath Tripathi sent a detailed report to New Delhi after Union Home Minister Rajnath Singh called for it, and central paramilitary force troopers kept strict vigil at the CBI offices here. Parallelly, Kolkata police sent notice to a top Central Bureau of Investigation (CBI) officer in an old case. The action-filled confrontation that began on Sunday evening when CBI officials showed up near the Loudon Street residence of Kolkata Police Commissioner Rajeev Kumar for questioning him in connection with the probe into the ponzi scheme scam, also rocked Parliament and reached the legal corridors in both New Delhi and the eastern metropolis. On Monday, Banerjee seemed completely at ease doing what she has always revelled in - street protest - and yet again lent her full backing to Kumar, a 1989 batch IPS officer who had headed the Special Investigation Team formed to probe the Ponzi scam in 2013, a year before the CBI took over the case following Supreme Court's order. Banerjee claimed that the centre is tagging the honest people as thieves while the "real thieves" are at large.
" I was peeved when they tried to get to Rajeev Kumar... He is leading the force. If Kumar is thief, whose money has he taken?" she asked. She claimed her "Satyagraha" was "non-political" and not against an individual agency but to oppose the "anarchic moves" by the Modi government to destroy democracy. "Our protest is against the attempts to divide the country and spread hate, intimidation and terror among people," she said, as her party activists put up rail and road blockades at various parts of the state, took out protest rallies with back flags and burnt Modi's effigy. However, Justice Shivakant Prasad listed it for Tuesday. Prior to the adjournment, Rajnath Singh defended CBI action, and told the Lok Sabha that the move to stop the central probe agency from performing its duties is "unlawful" and a threat to the country's federal system. Senior BJP leaders questioned why Banerjee was going all out to save Kumar. Human Resource Development Minister Prakash Javadekar asked whether she wanted to save herself or the top cop, while Law Minister Ravi Shankar Prasad said Kumar was being protected as he knew some "secrets".